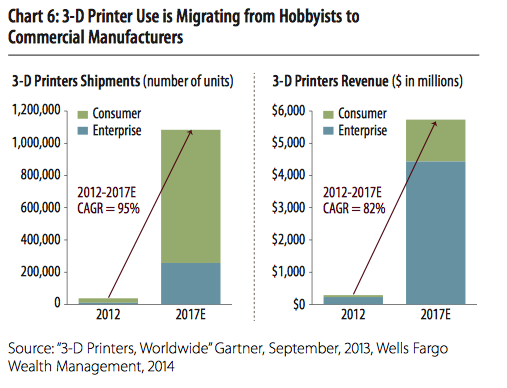 3-D printers are expected to grow into a $5 billion market over the next few years. Annually, printer shipments are projected to increase by 95% annually through 2017, by which time over a million units will ship per year. More than two thirds of them will be purchased by consumers. What will the world be like when millions of customers have their own 3-D printer? For more insights into 3-D printing and other evolving opportunities in technology, you can read this report from Wells Fargo. This entry was posted in 3-D Printing, Information Technology, Innovation and tagged 3-D printing, Information Technology. Bookmark the permalink.